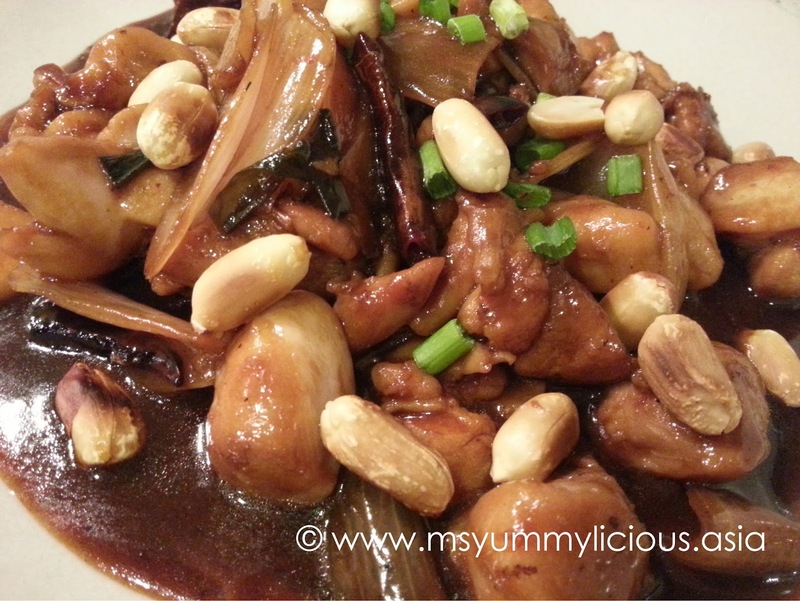 The cooking style - Kung Pao is originated from the Sichuan province of China. The authentic Kung Pao Chicken calls for Sichuan peppercorns but here in Malaysia Kung Pao Chicken or more known as Kungpo Chicken (宫保鸡丁), is a spicy stir-fry chicken with dried chillies, onions, ginger, spring onions and top with roasted cashew nuts. 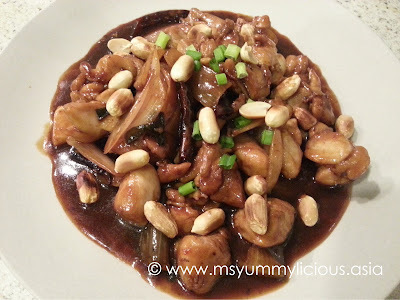 I wasn't a big fan of Kungpo Chicken UNTIL my mom (in law) cooked this dish during one of the dinners at home. It was so yummy-licious that I fell in love with this dish! I love the fragrance of the stir-fry dried chillies, spring onions, ginger and onions, combined with the spiciness and savory of the sauce. It was a perfect match! 1. Marinade chicken with oyster sauce and vegetable oil for 15 minutes. 2. Heat approx. 2 tablespoons of oil in a wok, stir-fry dried red chillies, ginger and spring onions until aromatic. 3. Add in onion wedges and chicken cubes and stir-fry until the chicken is cooked. Pour the seasoning in and stir-fry till fragrant. Thicken with starch mixture. Dish up and sprinkle with roasted peanuts and some chopped spring onions. ● I am using extra hot dried chillies. If you are using the normal type, you may use upto 10-15pcs. Make this recipe? Don't forget to snap a photo of it and tag #msyummyliciousrecipe on social media! I would love to see them! Enjoy my recipe! 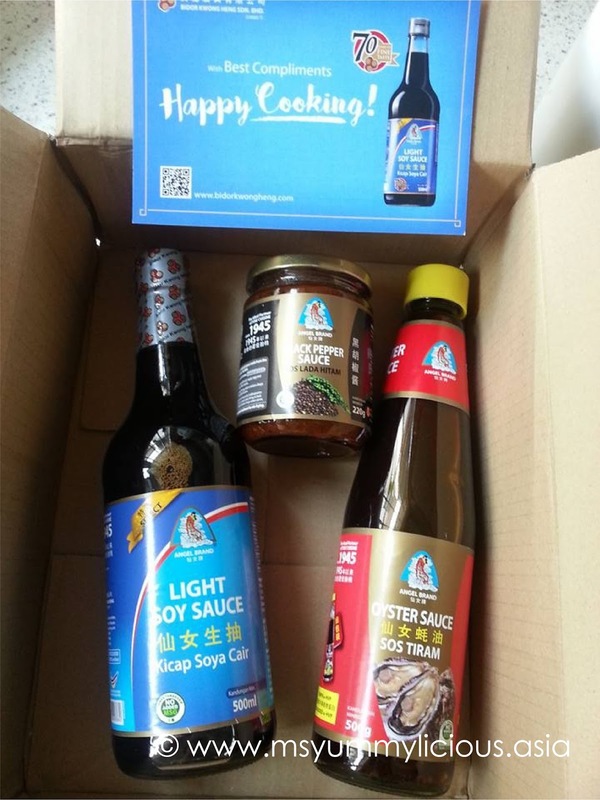 Last week, I've won myself a set of condiments from Bidor Kwong Heng Sdn Bhd in a fun giveaway hosted by DHM. I was so happy because I think this is the first time I've ever win anything online. The gift was delivered to me on an unexpected beautiful Saturday morning. The delivery was rather fast, I would say because it was only 4 days after I was announced as one of the 10 winners. Thank you, V and Bidor Kwong Heng! In my kitchen, I use a lot of light soy sauce and oyster sauce especially when cooking Chinese foods. These are the two common condiments used in Chinese cooking. As for the black pepper sauce, I have not use it before. Frankly speaking, I am NOT a fan of black peppery dishes. But since I've got a jar from the giveaway, I decided to make use of it. There are many recipes you can find on mushroom sauce but the one I love the best is making my mushroom sauce with roux. It has a deep nutty and intense mushroomy flavor. And depending on what I have on hand, I'll use either chicken broth or cream, or both. 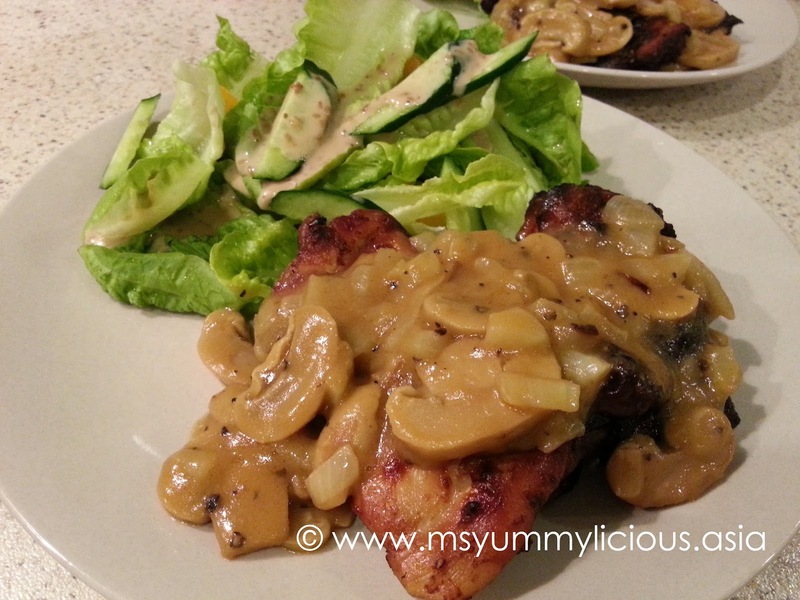 For this time, I am going to go for the simplest Mushroom Black Pepper Sauce. Enjoy my recipe! 1. Marinade chicken with salt, black pepper and lemon juice for approx. 15 mins. Grill chicken in oven at 200°C for 30 - 40 mins or until chicken is cooked. 2. While the chicken is in oven, make your sauce. In a saucepan, sauté onion until it started to soften. Add in mushrooms and continue sautéing until mushrooms are cooked and onions became translucent. 3. Push the onion and mushrooms to the sides. Add butter on the empty spot and sprinkle plain flour on it. Stir vigorously to combine. Continue to stir as the plain flour cooks. It will turn from pale color to medium brown color. Add in few splashes of chicken broth, and stir vigorously to combine. When it has combined, add again few splashes of chicken broth and stir vigorously to combine. For the third time, add in the remaining broth and stir to combine, stir in the onion and mushrooms as well. 4. Add in black pepper sauce and salt to taste. 5. Arrange the grilled chicken on plates and pour the sauce over it. Enjoy! ● To get instant chicken broth, dilute 1/2 cube Knorr Chicken Cube with 1 1/2 cup hot water. ● When making roux, make sure not to go beyond medium brown color. You might burn the butter and it will have bitter taste. If you prefer dark brown sauce, you can use clarified butter or ghee to replace butter. ● You may cook your onion/ mushroom and roux in a separate pan if you like. 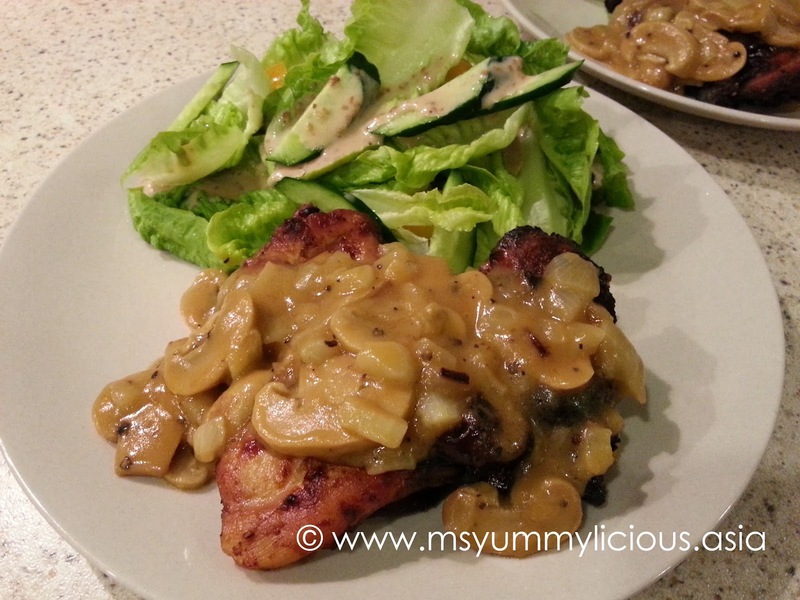 Or you may dish out your cooked onion/ mushroom to a plate while you cook the roux on the pan. 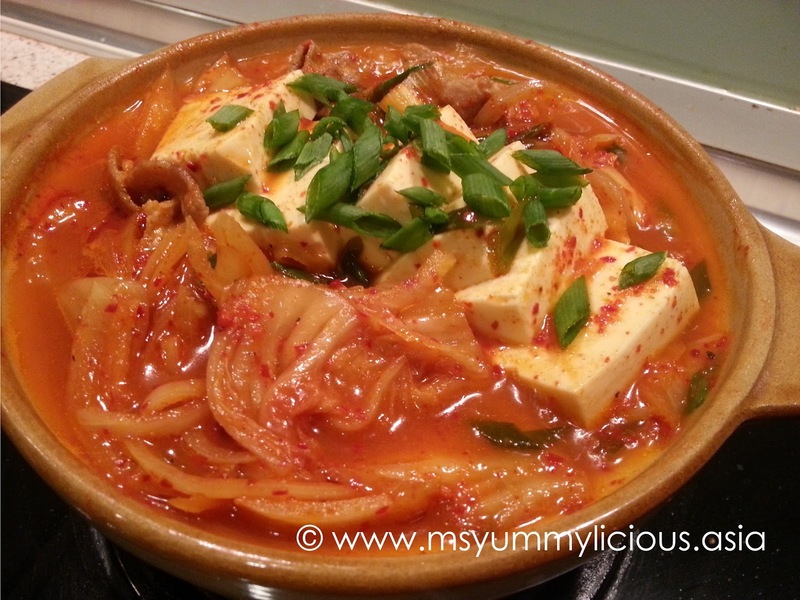 Finally, I've make my Kimchi Jjigae! I've been excitedly saving my last quarter of homemade kimchi specially for this dish. My kimchi has been sitting in my fridge for 4 months and it has fermented really well. The kimchi was sourish and spicy and they are just PERFECT for making Kimchi Jjigae. This savory, sourish and spicy dish is amazingly appetizing. 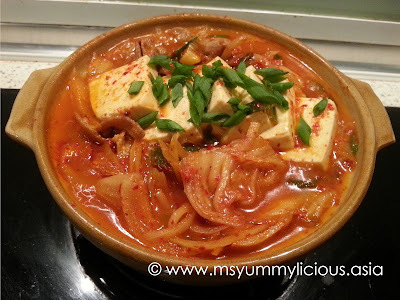 One can easily finished two bowls of rice with this jjigae. It is really simple to make! Two main factors in this yummy-licious jjigae are, to use a 'ripe' kimchi (at least fermented for 3 weeks) and use an earthenware pot to retain its heat throughout the whole dinner. 1. In a small pot, add dried anchovies, spring onion roots and water. Bring to a boil over medium high heat and continue to let it boil for 15 minutes. Strain and you should have about a little less than 1 1/2 cup of broth. Leave aside. 2. (****) Marinade the pork slices with 1/2 Tbsp of soy sauce and 1 Tbsp of oil for 5 minutes. Sear the pork slices until both sides are browned. 3. In an earthenware pot, arrange kimchi, pan-seared pork slices, thinly sliced onions, chopped spring onions, kimchi brine, anchovies broth and seasonings accordingly in their respective order. Cover with lid and cook for 10 minutes over medium high heat. 4. Mix the seasonings around with a spoon. Gently add the tofu in the middle and scoop some of the stew onto the tofu. Cover the lid and let simmer over low heat for another 10 minutes. 5. Sprinkle with some chopped spring onions and off the heat. Serve immediately. (*) Since this is my last quarter of kimchi, I used up all the brine. If you do not have enough kimchi brine, you can reduce it to 1/4 cup and use more broth in the stew. (**) You may use your preferred type of tofu. For Maangchi, she uses a firmer type of tofu. For me, I prefer the silken tofu, which is the softest type. (***) If you have daikon and kelp, you may add them in the broth as well, about 1/4 cup thinly sliced daikon and 4 x 4 inch kelp. (****) This step is not necessary. But searing the pork will give the stew a more flavorful taste. 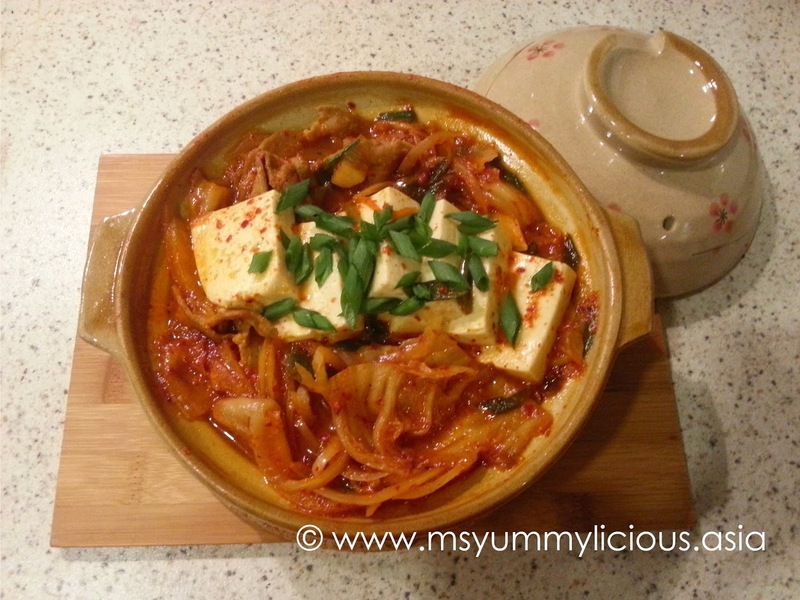 ● Serve this with white rice or tteok (korean rice cake), or even noodles. When I first learn this recipe from a cookbook (or tv show), it was 5 - 6 years back. I couldn't believe that this 'complicated looking dish' was so easy to prepare. 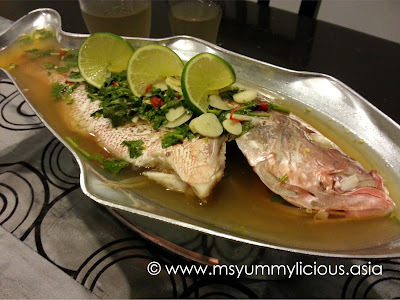 If you know how to steam a fish, you could not go any wrong with this recipe. Initially, I boiled all the ingredients in the chicken stock as per cookbook but recently, I've just discovered that there is no need to boil it. Just heat up the chicken stock and dissolve the sugar in it, then off the heat and dump everything in the stock. Let it sit for 3 - 5 mins for all the flavors to infused in the stock. The differences between boiling all ingredients and not boiling them is that the No-Boil version is more fragrant and robust, where else the Boil version is somewhat flat (but still good). If you have noticed, I am using thinly sliced garlic instead of chopped garlic, simply because both my hubby and I do not like to eat garlic. It's easier to shove them away when it is this way. Whether chopped or sliced, it still give the dressing a good garlicky smell. And if you don't have this serveware (as per photo), you may place your fish on a stovetop serveware and heat it under a portable stove when serve. This dish is best eaten HOT throughout the whole dining experience. This dish is surprisingly refreshing and appetizing with its sourish, garlicky, a little spicy, a hint of saltiness and aromatic smell of coriander dressing. It is simply irresistible! To get rid of the fishy smell, put a few slices of lime in the cavity, alongside with a few coriander roots and lemongrass. It is preferably to cut out the lime's rind to avoid any bitter taste on the fish. On my first try, I followed as per cookbook and somehow the part where the lime touches the fish got bitter. Whether is it because of the lime's rind or not, I just don't want to risk it anymore. 1. Slash fish 2 - 3 times on each side at the thickest part of the fish. This is to ensure the meat cooks evenly. 2. Stuff cavity with slices of lime, coriander roots and lemongrass. 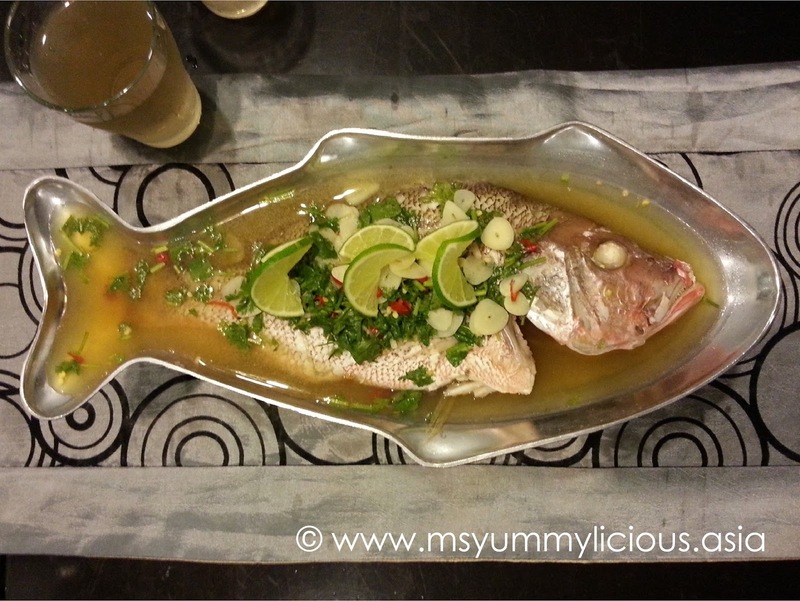 In a wok of boiling water, steam the fish for 8 - 10 minutes or until the thickest part of the fish is cooked. 3. While steaming, prepare the dressing. In a small pot, heat the chicken broth. Add in the sugar and stir until sugar is dissolved. The broth should be in gentle simmer. Remove from heat. Add in garlic and chillies, followed by lime juice and fish sauce. Give your dressing a taste and adjust the taste accordingly. Lastly add in the chopped coriander and let the dressing sit for 3 - 5 mins for all the delicate flavors to be infused in the broth. 4. Remove fish from steamer and transfer it to your preferred serveware. 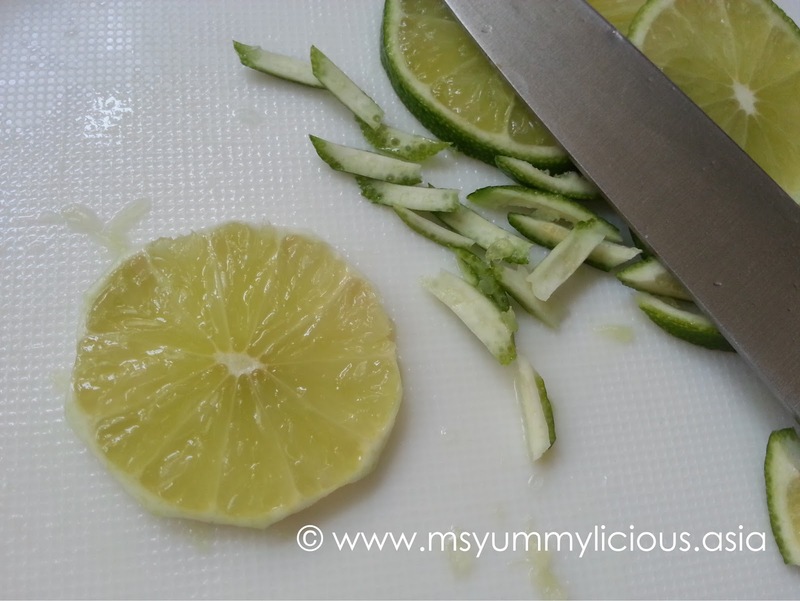 Pour the sauce over and garnish with some lime slices and fresh coriander sprigs. * Authentically, palm sugar was used. But since I don't have, I've substituted it with brown sugar. 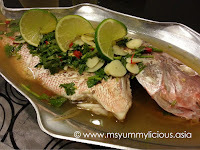 ● You may use any mild white fish, eg; red snapper, baramundi, sea bass, tilapia and etc. ● To get instant chicken broth, dilute 1/2 cube Knorr Chicken Cube with 1 cup hot water. 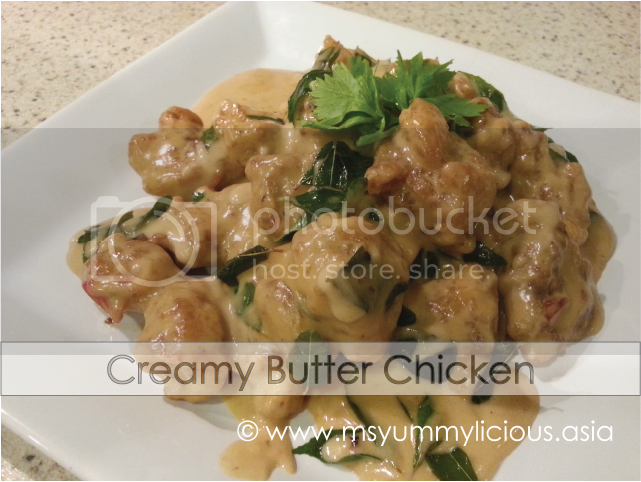 Creamy Butter Chicken or more known as Lai Yao Kai 奶油鸡 is a common dish in Chinese restaurants. There are two types of Lai Yao Kai 奶油鸡 - the dry ones with fine egg shreds and the wet ones with creamy sauce. While I preferred the dry ones, my hubby lurveee the wet version. This is one of his favorite restaurant dish. Previously I've cooked Butter Prawn but my hubby said it wasn't as fragrant as at restaurant and rated it at 6/10. Now with the improvised recipe, he said, "YES, this is it! This is very good! Just as at restaurant." 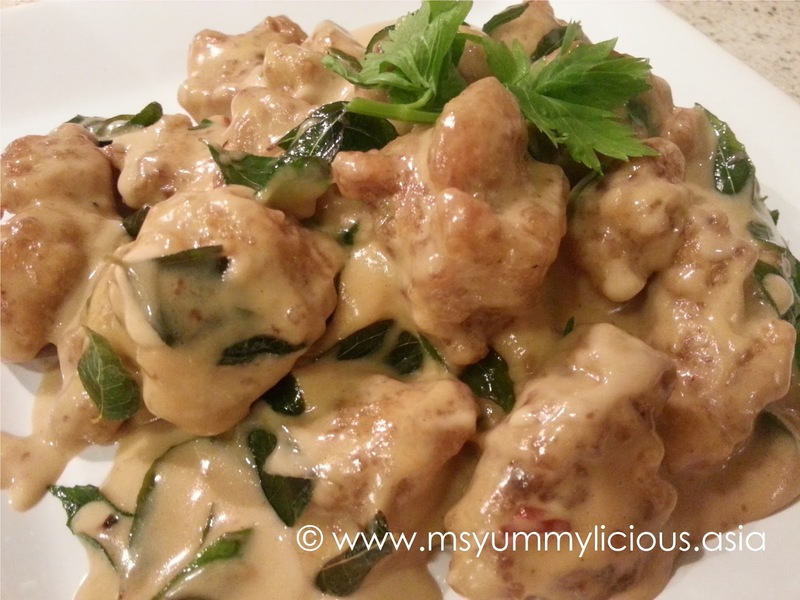 He rated this Creamy Butter Chicken at 10 out of 10 . Of course I was very flattered for getting such compliment from a fussy eater HIM. And he kept saying, "Very good!" as he eats with a big smile on his face. Each of these deep fried boneless chicken cubes were coated with creamy buttery sauce. The fragrant of curry leaves and a hint of spiciness instantly lifted your appetite as you take your first bite. It is super creamy-licious! 1. Marinade the chicken cubes with oyster sauce, salt and black pepper for 2 - 3 hours. Add in the egg in the last 15 minutes of the marination. 2. Combine tapioca starch, rice flour and seasoning powder in a shallow dish and mix well. Coat the chicken cubes in the flour mixture. Make sure to coat evenly. Let it rest for approx. 5 minutes before deep frying them in hot oil. Drain and set aside. 3. In a hot wok, add butter, sauté garlic until fragrant, follow by bird's eyes chillies and curry leaves. Sauté until you get a nice smell of butter & curry leave. Add in evaporated milk and let it comes to a boil. Add in condensed milk, chicken granules, salt, sugar, fish sauce and a dash of monosodium glutamate and pepper. 4. Add in the previously deep fried chicken cubes and stir to coat the chicken cubes evenly. Thicken with starch solution if needed. Dish up and serve immediately! ● It is important to let the chicken cubes to rest after coating them with flour, to give time for the flour to combine with the chicken. 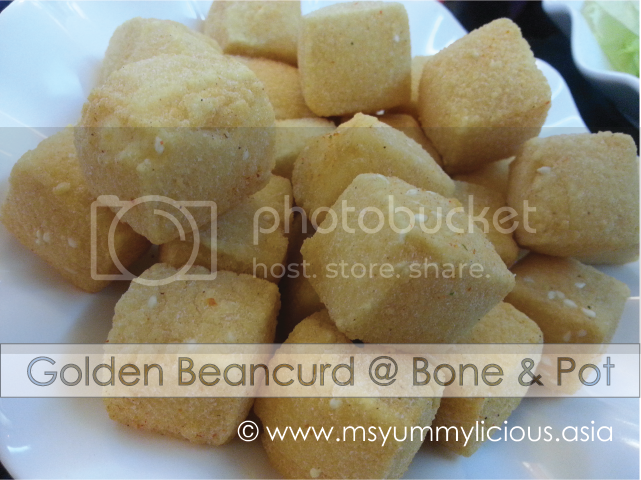 The smooth soft tofu is well coated with slightly seasoned flour and then deep fried to perfection. These photographs are licensed under a Creative Commons Attribution-No Derivative Works 3.0 License. 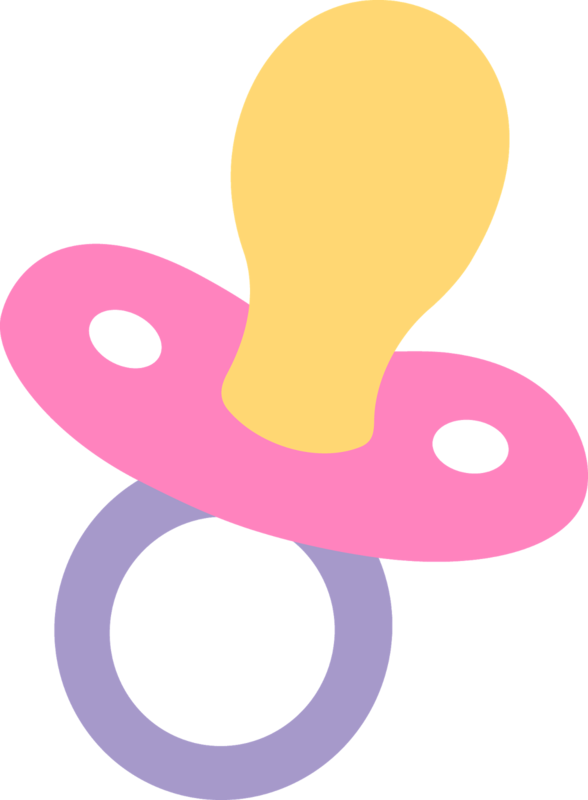 All contents in this blog are solely based on my personal opinion. 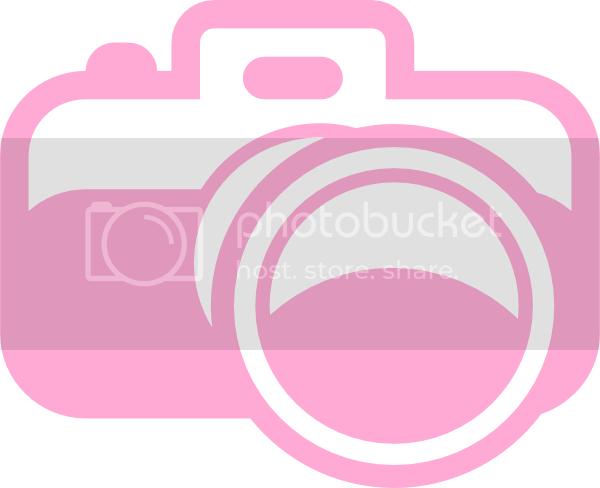 Disclaimer: This blog may generate ad income and accept advertising/ads & links.